Lynx Yachts of The Netherlands has launched YXT One, the first yacht in its Yacht-X-Tender (YXT) superyacht support vessel series. The 24m YXT One yacht is the first in Lynx's series of purpose-built support vessels aimed to cater superyachts between 30 and 70 metres. Naval architecture comes from Diana Yacht Design. The support vessel is designed to carry tenders and toys, freeing up space on the mothership and negating the need to tow large tenders. When in port, the YXT yacht can serve as a large beach club/relaxation area and can optionally be outfitted with a sauna, spa and gym or offer additional accommodations for crew and guests. This is the second launch from the up-and-coming superyacht yard Lynx. Its 33.4m modern classic, twin-screw canoe stern superyacht Heliad II, also by Diana Yacht Design, was launched in May 2013. Heliad II represents Lynx Yachts' division building custom yachts up to 55 metres LOA, while its second division concentrate on building the YXT superyacht support vessel series. 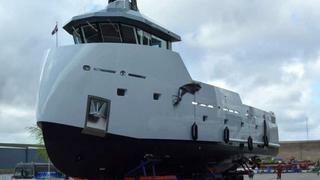 YXT ONE is now undergoing sea trials and final commissioning before heading for the Mediterranean. She is offered for sale through Vassilis Fotilas of Fraser Yachts.